Imogen's Typewriter. 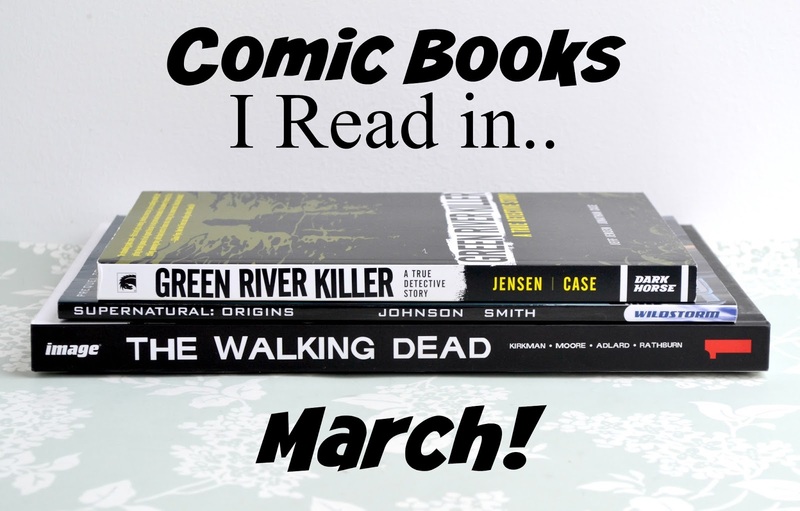 : Comic Books I Read in.. March! I actually said 'wow' out loud in an empty room after finishing this. Written by his son, the story of Detective Tom Jensen's search for the Green River Killer rings true. It has everything you want in true crime; honest interviews with the killer and the victims families, personal moments, gruesome killings. And everything you want in a graphic novel; the phenomenal art is black and white, and it manages that delicate balance of enough words on a page without overcoming it that every graphic novel struggles with, beautifully. The back is coated in positive comments from Stephen King, Damon Lindelof, Brian K Vaughn and more, all of whom agree with me that if you have even the vaguest interest in graphic novels, non-fiction or true crime then this is the book for you. My brother got this for me after my obsession over Christmas with Making A Murderer on Netflix and I can honestly say if you enjoyed the show, you'll love this. The question now is- where do you put a true crime graphic novel? With non-fiction or comic books? I restarted watching Supernatural this month and after getting stuck on a couple novels I was reading, decided to pull out this origin story. I'd never read it before and can honestly say I'll never read it again. The story was just so unnecessary. It basically fills in the time that the show leaves to your imagination- directly after Mary dies, but in such a weird acid trip hallucination way that it just leaves you with more questions. And the art. Sam is six months-ish and is at one point sitting on a pool table unsupported like a little demon monkey. I could barely tell who was who. I think I'll stick to my non-TV-spin-off comic books. This isn't a TV spin-off, the comics came first. Just so you don't think I'm a lying liar who lies. With the finale of The Walking Dead Season 6 at the beginning of April I really wanted to go back to the comics and I'm glad I did. I love The Walking Dead comics. They're so fast-paced, this collection of issues 1-12 covers season 1 and 2 of the TV show. They're action packed, so many things happen there is absolutely no filler pages. And the art is great. I personally prefer the faces and the detail in the shading that Tony Moore did for the first six issues but Charlie Adlard picks it up well and soon makes it his own. The world is laid out clearly, there's nothing confusing and because it's the base of the spin-offs, there's no insider knowledge that might put you off. Really, it's a must for any fans of the show or just general zombies and I recommend hardcovers that collect 12 issues. You can really get them open to see the full page, and they still look brand new on the shelf. It's not the same as killing the dead ones, Daddy. Did you read any comic books/ graphic novels this month? Have you read any of these?